. 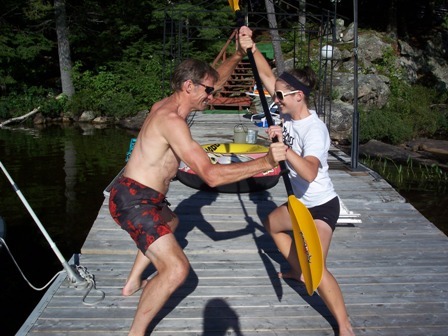 : Summer workout at the cottage :: Ski XCOttawa.ca :: Skiing in Ottawa and Gatineau Park :. -Horizontal pull-ups with a partner and a paddle. If the person standing up is really strong, he/she can also do an upright row using this set-up. -Upright row using a paddle and buckets of water/rocks for resistance. -Wouldn’t want to forget pull-ups! If you can find something to hang from, you can do forward and reverse grip pull-ups. -The partner paddle battle – assume a sumo wrestler position and try to push your partner away from you (and potentially into the lake). -(Attempted) squats on an inner tube for improving balance. Needless to say, this does not always end well. -Knee tucks from a plank position, with your feet on a floating inner tube and your forearms on the dock/land. -Similarly, you can do push-ups with your feet on a floating inner tube and your hands on the dock/land. 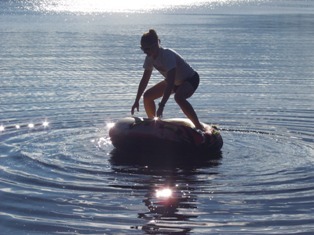 Using the inner tube adds a component of balance to the exercise. -And of course, there is always wood chopping. Not only does this simulate double-poling very well, it is also appreciated by the cottage owner (especially if you stack the wood too! ).